Sys Optimizer is an easy to use optimization solution that automatically configures. So there is not worry to select the folder which should be deleted. It automatically configures the Files and folder that are to be optimized. It supports deleting cache folder and history folder of Internet Explorer, Google Chrome, Mozilla Firefox, Opera, and Safari more browsers will be supported in the upcoming versions. It's a easy to use and reliable piece of software that allows you to delete Internet data, temporary file or empty folders, and also enables you to easily uninstall applications. Sys Optimizer is a compact application designed to help users delete temporary files and cache items stored by web browsers. This way, you can free up some space on your disk and make sure your sensitive data remains private from unauthorized viewing. As soon as you run the utility, you are asked to select which items should be deleted from your computer, namely data saved by web browsers, system files, which are created when installing tools on the computer, as well as temporary items. The clean and straightforward layout gives users the possibility to start a new scanning process with just one click. The program offers support for the following web browsers: Internet Explorer, Google Chrome, Mozilla Firefox, Opera, and Safari. At the end of scanning procedure, you can view details about the Internet and Windows files found on your system, open the location where the items are stored, as well check the size occupied by the found items. What’s more, you can view details about the processes that use a high amount of memory, scan the selected drive for empty folders and delete them, as well as select a power plan for saving energy or balancing performance with energy consumption. 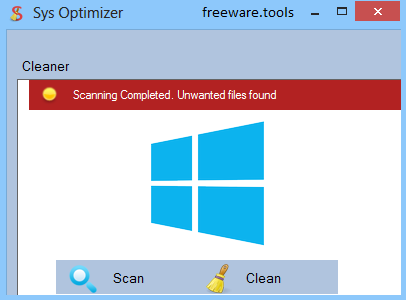 In addition, there are dedicated tools for helping you uninstall programs from your computer, plus a separate process manager, which lets you kill the selected tools. When it comes to configuration settings, you can change the look of the application by selecting from various skins, make the tool start a scanning task at Windows startup, and receive notifications when a process exceeds a user-defined memory value. As a conclusion, Sys Optimizer offers a handy set of parameters for helping you delete Internet data, system files, and empty folders, as well as uninstall applications. The feature pack is quite solid, and given its ease of use, it is suitable for rookies and professionals alike.